A lot of people have been asking about some computer glasses a few months ago, so here’s my review and recommendation. If you spend any significant amount of time on a computer for you work (or play for that matter), you’ll soon notice that our eyes weren’t meant to stare at an LCD screen all day. I’ve noticed this, but when I started working full time as Web Developer last summer, I began to notice just how bad things were. Many days after work, I would have an intense headache or my eyes would be really tired and worn out. I knew this couldn’t be good for my eyes, but I really didn’t know what else to do. 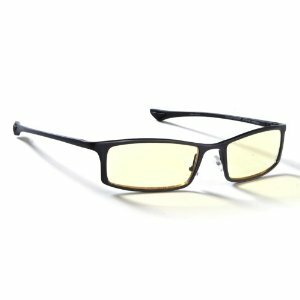 Then one day, I randomly came across gunnars.com. They understand this problem and have created “Digital” eyewear. What they make is glasses that help people like us, who spend 3 or more hours a day on the computer, to limit eye strain and help reduce headaches. GUNNAR Optiks makes digital performance eyewear that enables the human visual system toachieve a higher level of performance while in front of any digital screen. GUNNAR eyewearalso protects the eye from the negative side effects associated with using computer or televisionscreens for extended periods of time. The biggest thing I can tell that they do, is they have special lenses that block out the harmful rays on the color spectrum that cause the most pain and annoyance. I read through their site, liked what I saw, and purchased the Onyx Phenom Glasses from Amazon. (I love Free 2 day shipping). When they came, I tried them on and could definitely tell they would make a difference (wasn’t sure whether that would be bad or good). They have a yellow tint, so I could tell colors were going to look a little different (they have a clear option for Graphic Designers, my brother got a pair and seems to like them). They also have a bit of magnification to them, but not much at all, so it wasn’t too noticeable. The nice thing about them, was they felt very sturdy and I didn’t feel like they would break after a few months. Well, the only way to tell if they really worked as advertised was to use them for a few days, and while the first few days took a little adjusting to the yellow tint, now I use them everyday and don’t notice a thing. After the first week, I could definitely tell an drastic improvement. I got a lot fewer headaches (if any) from the screen and the Eye strain dropped to almost none. I still get a little weary from working on my computer all day, but I think spending 10 hours a day in front of a screen is going to do that, no matter what, but not at all compared to before hand. I was skeptical at first, but these glasses really work. The biggest improvement is at night. Before the bright screen in a dark area was horrible on my eyes, but now it doesn’t really bother me. Are these glasses for everybody? No. They cost me about $90 so they are by far my most expensive pair of “sunglasses” and I don’t even take them outside. However, for anyone spending 3-4+ hours a day on the computer, I would really recommend you consider giving them a try. They have a 30 day warranty, so if you really don’t like them, you can always send them back, however, once you begin wearing them, I don’t think that will happen. Let me know if you have noticed these same problems when working at a computer and if you think these glasses could help you.